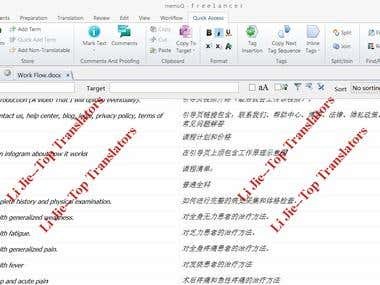 I'm a Chinese native speaker and a professional translator with years of experience in translation between English and Chinese. 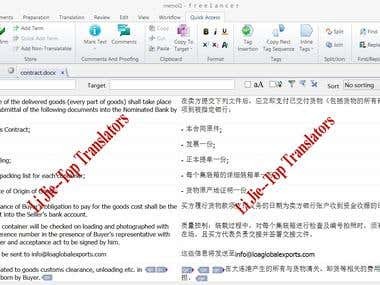 With my skills and experience in both language art and IT fields, I am capable of translating documents across different areas with high quality. I only deliver quality works, and I always respect timeline , aiming to create best translations for you. What can I do for you? 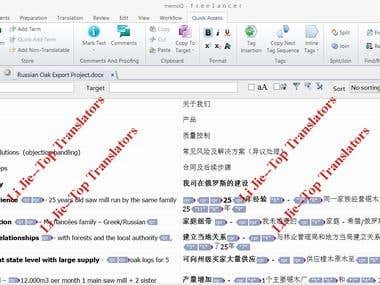 English-Chinese translation Chinese proofreading Chinese transcription English or Chinese subtitling/caption Add Chinese influences into your design Any question about China or Chinese Help buy things on Taobao, Tmall, [login to view URL], etc. Please feel free to contact me. I have translated around 50,000 words of subtitles which are mainly lyrics and videos. 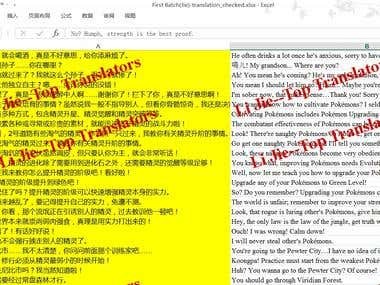 I have translated around 100,000 words of text related games, such as Play Instructions, introduction of game characters, player feedback and so on. I have years of professional translation experience, including books, contracts, software localization, website localization and subtitles. With my skills and experience in both language art and IT fields, I am capable of translating documents across different areas. Awarded a certification for level 2, grade two from State Language Affairs Commission with a score of 85.1 point.